A monthly selection of our most reserved apartments and best selling features according to our guests. This month’s Best Seller is, according to our guests, one of the best locations to stay in Barcelona. Parsifal is located at La Rambla, very convenient to The Mercat de la Boqueria, which has the freshest produce and gourmet items with the most flavor of the city. Very close by Gran Teatre del Liceu, the internationally renowned temple of music, Plaça Reial with its arcades, fountains and lampposts designed by Gaudí. All these are must-see stops. On the other side of the Rambla, we travel in time to historical Barcelona, guided through the narrow streets of the Gothic Quarter and further along, the cosmopolitan neighborhood of El Born, a haven for artists and trend-setting avant-garde fashion boutiques. We speak of a spacious apartment with a large living room with fully equipped kitchen with stainless steel appliances. Three bedrooms, two of them doubles and one individual, willl guard your dreams, which will be placid and relaxing, as all the bedrooms face away from the street Sant Pau. Our Parsifal apartment has two full modern design bathrooms, one en suite in the master bedroom, with large showers and heated towel rails to keep your towels warm. Central air conditioning in all rooms. All windows are double glazed aluminum anti-noise for great soundproofing and insulation. 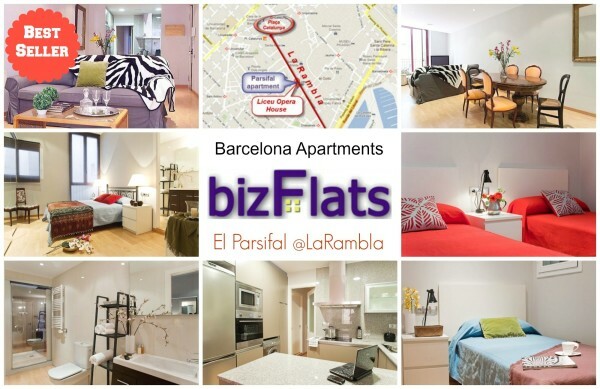 If you are coming with your family this is by far your best lodging option in Barcelona. In the same city block as the great “Liceu” opera house building, 20 metres from La Rambla, the most lively boulevard in the city. A charming apartment, accommodation for 5 persons, from €130 per night, with an unbeatable location, equiped kitchen, excellent communications to the centre and for day trips out. RESERVE NOW! Available dates this month: 20-28th May…hurry up!